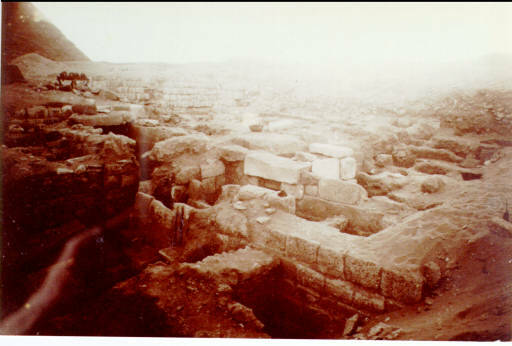 The destruction of excavated antiquities can be documented, for example, using photographic evidence in the archives of the Boston Museum of Fine Arts (MFA). 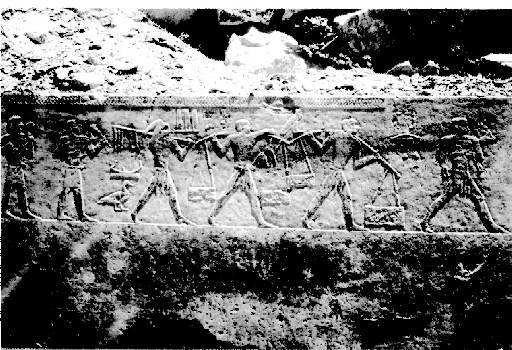 At the left is a scanned slide (hover over to enlarge) of Tomb G7560 in the Cemetery of Giza, Egypt, showing the condition of the hieroglyphics located on the north wall of the tomb as of June 29, 1929, during excavation. 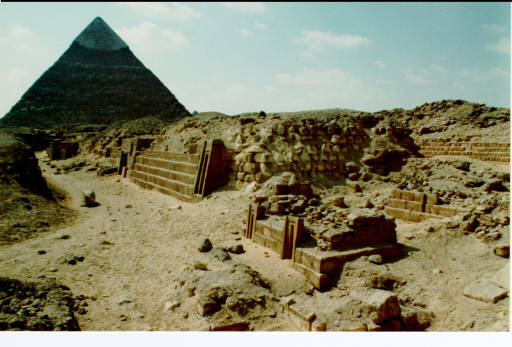 Also in the MFA archives is a second slide of the same set of hieroglyphics taken in August 1989. By this time, the top part of the scene had almost completely peeled off, and graffiti had been scratched over and below the remaining hieroglyphics. 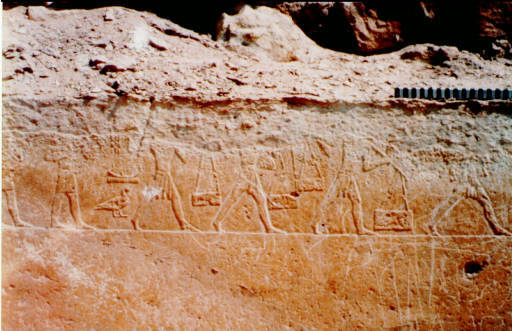 The loss of information contained in secondary evidence about excavated sites is illustrated in another scanned slide (also from the archives of the MFA). The museum's collection has a glass negative (seen at the left) showing part of the Cemetery of Giza as of 1912. Upon comparing the scanned image, seen above, with a scan of another print taken from the same glass plate in 1993, it was too clear that significant degradation of the original image had already taken place. Irreplaceable visual documentation had been lost. 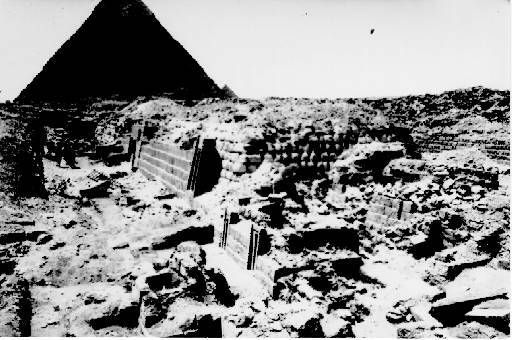 An equally disturbing state of affairs can be seen by comparing this image (also from the MFA archives) that was taken in 1938 after the excavation season at Giza had been completed, with the more recent view below. 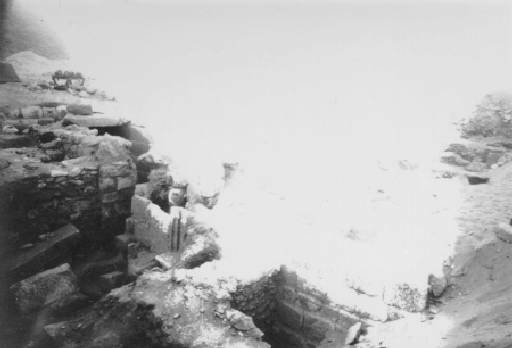 A photograph of the same area taken 55 years later indicates that the cemetery had begun to fill back in with blowing and drifting sand, thus obscuring the earlier work from view by visitors and researchers. Thus, what we are witnessing is not only the deterioration of the actual antiquities themselves, but also of the only surviving original visual records of those monuments. Sites once accessible to scholars and the public are rapidly disappearing and, as photographic emulsion peels off old glass plates at an alarming rate, documentation of these places is disappearing as well. From these initial realizations grew the ideas of applying CAD (and associated graphics) programs to attacking this situation while at the same time using the digitized data for the collection, analysis, and publication of the ancient sites, and then using that data as the foundation for globally accessible educational materials. A number of demonstration and research projects followed using data supplied to Riseman by the Museum of Fine Arts, Boston. The CAD models of the sites remained the foundation of his work, which included the process of re-creating the ancient buildings and sites, the process of visualizing ancient built environments, and the process of building a multilayer, multimedia experience. We invite you to review some of his results on the Early Projects pages.